The chapel serves the community of Alice Springs, providing a place for gathering, grieving and celebrating the lives of friends and family who have died. It is designed to be a non-denominational space, open to all religions and ceremonies. The chapel is designed to act as a one-room open pavilion or a one-room enclosed space, depending on weather conditions. Service spaces are contained in two blocks forming the side walls of the nave, with large sliding panels or discreet doors providing access to a kitchenette, celebrant preparation room, family viewing room, toilets, and an alcove for storing a digital screen and other IT equipment. 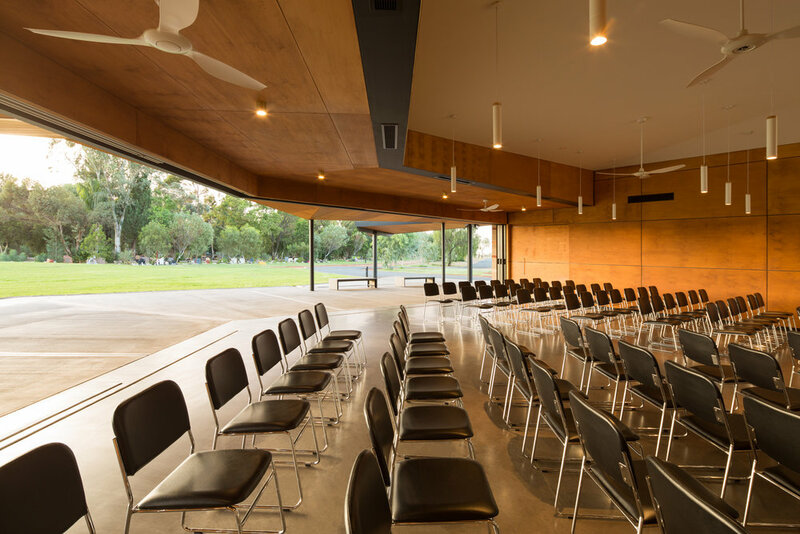 The large sliding doors to the verandah are key to the flexible use of the facility – one central door can be opened partway to provide entry to a central aisle in inclement weather. All six doors can be opened and stored in concealed cavities to provide an uninterrupted, 13 metre-wide opening to the verandah. Also the two side doors can be pushed towards the centre to provide access to two side aisles, if that is the preferred seating arrangement. The enclosed nave of the chapel seats 100 people comfortably, though would feel appropriate with a more intimate service. The nave opens fully to the wide verandah which can seat an additional 150 people. The verandah adjoins a wide grassy area with a low-relief mound to its perimeter that can seat an unspecified number of additional people. The service can also be conducted under the apex of the verandah, with the congregation gathered either outside the verandah, or at 360 degrees around the focal point of the service. The quality of light was carefully considered in the interior, with a roof light over a lightwell at the focal point of the nave. The light from the light well has natural variations and subtlety not possible with artificial light. The interior is devoid of ornament except for a sculpture in clear, translucent and opaque white Perspex suspended in the lightwell that was designed and installed by the architect. This sculpture interacts subtly with the varying qualities of light from the lightwell and moves slightly with air movements. The materiality of the building was a deliberate strategy to convey the meaning and purpose of the chapel and its intended longevity. Stained plywood, bare concrete and concrete block and inserts of local sandstone combine in a simple and dignified composition.